The basic supply of electricity and gas to the economy is one of the pillars of the Energy Industry Act. However, the safe and reliable supply of energy is even more essential in the medical sector. Both electricity and heat can save lives here. To ensure this security of supply in the future, the University of Göttingen Medical Centre (UMG) and the University of Göttingen have jointly initiated an innovative energy supply concept. The central component is a 4.5MW combined heat and power (CHP) unit from ETW Energietechnik. 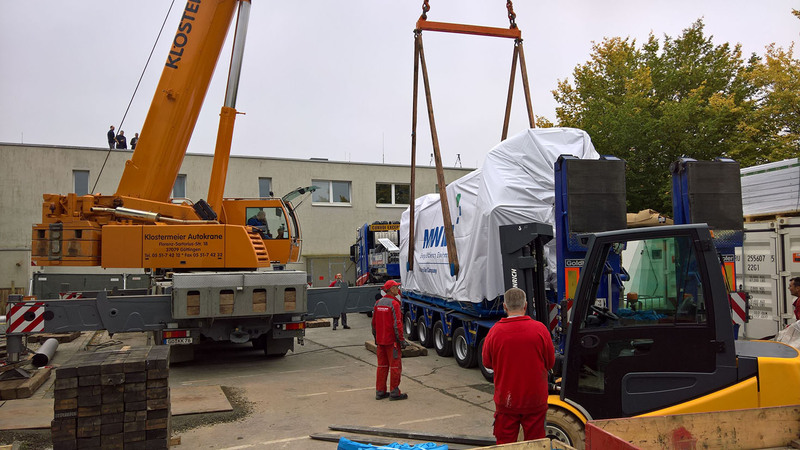 At the end of September 2017, the ‘heart’ of the new CHP plant of UMG, a gas engine with generator, was delivered. A heavy-duty crane lifted the 53-ton unit into the new building. The engine and generator alone account for around €1 million. Since the end of 2017, the first of the three power plants has now been supplying about half of the electricity required and the basic heat requirement of the university hospital. 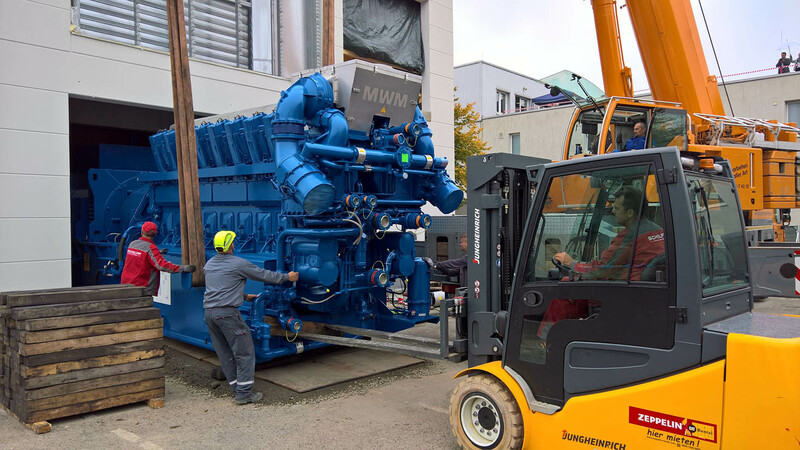 The 4.5MW cogeneration plant was developed and supplied by ETW Energietechnik. It contributes around 50% to the electricity requirements of the University Hospital Göttingen. The total efficiency of the energy utilisation, electricity and heat output, amounts to about 90%. The state of Lower Saxony will bear the costs of around €4.7 million from the August 2014 Rehabilitation Programme for University Medicine of Lower Saxony, but the investment will not only save energy costs; security of supply and the saving of 6,500 tons of CO2 per year will also make an important contribution to climate protection. Security of supply in particular is a key element of the new energy concept. The University Medical School Göttingen (UMG) as a clinic of maximum care has an annual heat energy requirement of more than 33,000 private households. For this purpose, the waste heat from the engine and the hot exhaust gases are decoupled and used for their own use. UMG relies on a cogeneration plant for the generation of heat and electricity, which generates energy particularly efficiently with continuous heat output. It has a heat output of 4.75MW and has a 33m high chimney stack. Since January 2018, around half of the electricity required in the university hospital has been produced, thus covering the basic load of heat supply for the hospital. The heat is mainly used to heat the drinking water and for the room heating of the central hospital building. The energy-efficient plant technology of the CHP reduces the consumption of resources and reduces environmental pollution and emissions. “The new CHP is thus an important contribution and a good example of the integration of biogas into sustainable and modern energy supply concepts,” summarises Dr Oliver Jende from ETW Energietechnik. The two subfoundations University Medicine Göttingen (UMG) and the University of Göttingen coordinate their joint energy policy and founded the Universitätsenergie Göttingen in 2009. Their goal: both partners want to use the energy required for the foundation university efficiently, in an environmentally friendly and cost-effective manner. The core of the energy supply concept is to bring power generation close to the main consumers in order to minimise transmission losses. The UMG has an annual electricity requirement of about 57,000MW-hours of electricity and about 100,000MW-hours of heat, the university of 50,000MW-hours of electricity and 67,000MW-hours of heat. In the UMG, electricity and heat are also used for central cooling production.